There are few disadvantages in hunting from a blind. That’s especially true of rigid-sided blinds like those made by Advantage Blinds. They are built to be safe, decrease scent dispersion, and hide movement by the hunter. They are wind and water tight, and are designed so that it’s virtually impossible for deer to tell that a hunter is inside them. Even better, Advantage Blinds has designed a series of options that increase the flexibility of how these blinds can be used by giving the hunter multiple choices for the type and height of the platform their blinds sit on. One favorite is their 10-foot galvanized steel quadpod platform, which works with all of their two-person blinds. The galvanized steel legs and braces ensure years of use with minimal or no maintenance – a good match for the Advantage blinds themselves, which are also designed to be virtually maintenance free. The 10-foot Quadpod with a blind gives the hunter a viewing height of 14 feet – but weighs only about 150 pounds, allowing two people to pick up the Quadpod with a blind attached and move the entire unit. All Advantage blinds can also be fitted with a trap door kit, so elevated blinds can be accessed from below. This kit is optional, but each Quadpod now comes with a free tie-down kit, which Advantage supplies to increase the stability and safety of their blinds. For locations or habitat types that demand that an Advantage blind be set up at some other height, Advantage makes an economical Quadpod Kit. They designed it to give hunters maximum flexibility in blind placement. The Quapod Kit is universal – you can use it with a trap door or side door, and it will work with 2-man or 4-man Advantage blinds. The kit itself is a welded steel frame that mounts to the bottom of any Advantage blind with through bolts, washers and nuts (which are included). Advantage recommends using 2X4 cross bracing on 4X4 legs for stability at heights above 6 feet. The wood is not included in these kits, because each hunter will want to choose the height (and hence the length of the leg supports) for the kit. As with the 10-foot Galvanized Steel Quadpod, the Quadpot Kit comes with a tie-down kit. 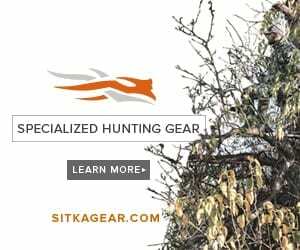 This hunting season, make the decision to hunt safer, more effectively, more comfortably and at the height that best suits your favorite stand site with Advantage Blinds. Because the best hunters use every Advantage they can get. For more information on advantage Blinds and accessories, check out http://www.advantagehunting.com. Advantage Hunting Blinds are the leaders in rigid, portable, lightweight, scent-proof blinds. Our blinds are so technologically advanced in function and design that you can enjoy hunting more successfully and comfortably with less maintenance.